Get your moustache on this Movember with this epic countryside themed moustache badge. It is a brown plaid/tartan print with a white moustache at the centre. 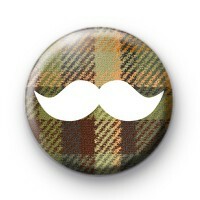 A tash badge is a great way to show support, especially if you're unable to grow a tash of your own (ladies). We often send them to the friends & family of Mo-bros who are raising money for Movember. We have a great selection of moustache badges in our moustache badge section. These are also super popular with stag parties & barber shops. Standard 25mm button badge made by hand in our family workshop.